There are a number of fitness trackers available in the market over the past year or so. I wasn’t aware the existence of this Jawbone UP Move until I got it from my Uncle who returend from the States. Unlike other fitness trackers, the Jawbone UP Move has a rather simple design which I thought I was given a toy wristwatch. It has been my favourite fitness tracker ever since that day. 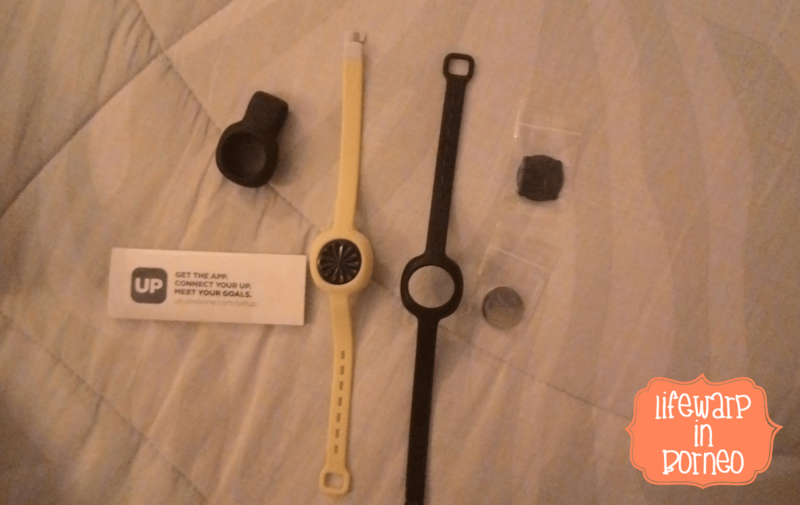 So, today’s review would be on Jawbone UP Move. Not a very technical with all those IT jargons. No. I would review based on the perspective of a newbie who doesn’t know anything about fitness tracker. Keep abreast of your fitness progress with the Jawbone UP MOVE activity tracker. Just clip it anywhere on your person and let it track your steps, sleep pattern, exercise, and calories burned. Then, the LED display and Smart Coach feature will give you a personalized assessment based on this information to help you achieve your health goals. Activity Tracking gives you a simple way to document your steps, exercise, sleep patterns, and overall calories burned throughout the day, helping you to get more active and stay motivated. Smart Coach feature suggests changes based on your personalized assessment so you can adjust your daily activity in a way that will benefit you the most. Sleep Tracking gives you the inside scoop on your sleep pattern, letting you know how many hours and the quality of your shut-eye sessions, learning your habits so Smart Coach can give you personalized suggestion to help you get enough sleep. Lithium coin battery supplies 6 months of power. Receive recommendations on how to stay fit – The Smart Coach feature helps you understand what to do to improve your step count each day. Log what you eat and drink – Take a photo, scan a barcode or search the UP app database with your smartphone or tablet to track nutritional info. Discover how your daily activities affect your sleep – Monitor how long and how well you sleep and see insights on how it relates to your daily activities. Stay motivated with a complete picture of your daily and nightly activities – Syncs with your smartphone or tablet to track steps taken and calories burned. Discreet and comfortable to wear – Clip the device to your pocket, belt or bra. Built to withstand rain and sweat. Challenge your friends for extra motivation – Compete against and cheer on your friends and family. Compare stats and see how your progress measures up. Free UP app provides a network of support – Monitor your progress online with a customizable dashboard equipped with tools, charts and graphs so you can visualize your progress. Visually track training – An LED display indicates time and progress toward your fitness goals. See real-time progress by syncing wirelessly with smartphones, tablets and computers – Syncs wirelessly with select smart devices, saving you the hassle of having to connect cords or manually enter data. Designed with comfort in mind – Sleek and lightweight, this device is durable enough to withstand rain and your sweatiest workout, and comfortable enough to wear while you sleep. Button battery – Be sure to replace the battery when needed so you don’t have any gaps in your tracking data. The packaging itself isn’t what you’re expect it to be like FitBit or Apple Watch. No box. Just everything you need to get going. The package includes UP Move tracker, a battery, rubber clip, tool for removing the rear, and 2 wrist straps. Unlike FitBit and other available fitness trackers, the Jawbone UP Move device does not incorporate a rechargeable battery, but it uses a lithium cell that can last for 6 months. Besides, UP Move automatically connects to your phone via Bluetooth 4.0, and it will sync your data whenever you open the data. The little coin-sized device features LED icons is rather lightweight. I must say this tracker is rather female-friendly because of its simple design, and smaller size. The straps is made of Medical grade TPU rubber strap (it doesn’t leave my wrist with itchiness because I’m allergic to certain rubber straps). The best thing about this tracker lies on its Smart Coach as it offers very insightful and helpful features that you should consider of. The Smart Coach is tailored to give daily advice based on the data that you’ve logged. The only thing that I rather feel lazy to do is to record every single thing that I’ve munched down. The UP Move is used to track my daily activities, and sleep pattern only. Not food. I’m too lazy to do that. Anyhow, this tracker actually allows you to personalize your fitness path by connecting to your favourite fitness apps such as MyFitnessPal, RunKeeper, and so on. There are more than 20 apps available for you to connect with Smart Coach. Unfortunately, one cannot expect this tracker to has the ability to notify you when you have a call or even messages. This tracker does not offer such features as it only focus towards those who want to monitor their daily activity levels. It’s rather simple and basic. It does not track your heart rate and perspiration levels. Moreover, it cannot be used while swimming or in the shower. It also doesn’t have the GPS features for you to connect with your RunKeeper, etc. If you’re looking for your first fitness tracker which can monitor your daily activity and sleep, Jawbone UP Move might be your best choice as this entry-level fitness tracker can track and report your steps, distance, intensity, workouts, types of activity, idle time, active time, and calories burned. It might look like your childhood wristwatch but this tracker offers you the basic needs that you need in order to lead a healthy lifestyle.